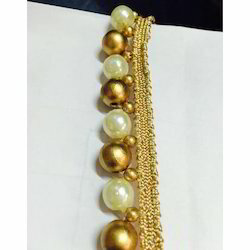 We are the leading Manufacture supplier of Sandal laces and offer this product as per client requirements and this product made by our expert with Good quality. 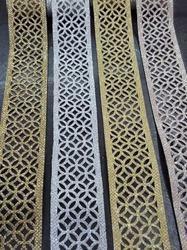 We are offering a wide range of Golden Jhalar Laces. 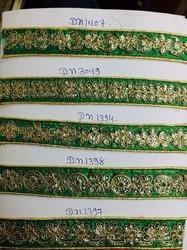 We are offering a wide range of Designer Embroidery Lace. 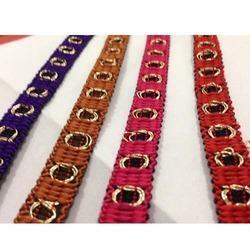 We are offering a wide range of Khajoori Moti Laces. 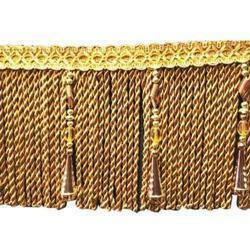 We are offering a wide range of Colorful Sarees Border Laces. We, Seema Industries, have incepted in the year 2004 from then engaged in offering our clients with the qualitative range of designer Shoe Laces & Straps in variety of patterns & designs. 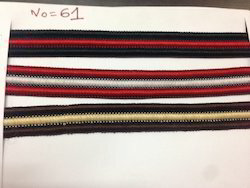 With our large production capacity we manufacture and supply a wide spectrum of Polyester Shoe Laces, Flat Shoe Laces, Fancy Footwear Laces, Designer Shoe Laces, Ladies Boot Laces, Mens Footwear Straps & Ladies Slipper Straps prepared using premium grade materials. Apart from this, we owns to a sole proprietorship firm, which is based in Surat, Gujrat, from here we serve to our nationwide clientele base. Our Shoe Laces & Straps are appreciated for their ultimate creativity, quality, finish and comfort. Additionally, in order to come up with the best designs in footwear our team takes care of the entire production process & leaves no chance for mistakes & defects. We follow a positive business approach along with the quality-proven operations that enables us to gain the trust of our clients. Besides this, some of the main attributes of our firm are punctual delivery system, high-tech production base, latest tools & machinery, best designers of industry, excellent market reputation, and suitable price range. Additionally, workers employed with us & best infrastructural facilities are the life line of our firm’s that strengthen us to deliver a wide variety of footwear on stipulated time. Today we enjoy a great reputation in the market it is just because of the non-stop hard work of our team that is capable to fulfill bulk orders on time along with quality.